SmartFem® is a nationally known women’s magazine and women’s advocacy website founded by Lea Woodford in Phoenix, Arizona that provides information and the best deals for only the best products and services by local companies that are carefully screened for women. Offering a smart, interactive resource guide for the popular iPhone, Android, Windows, and BlackBerry smartphone, the iPad, or any other connected mobile device. SmartFem provides today’s woman on the go with everything she needs to navigate her daily life. With the look and feel of a chic fashion magazine, SmartFem’s website and mobile application provides users with information on relationships and romance, the latest in fashion and beauty, new trends in health and fitness, as well as what’s happening in pop culture and entertainment. SmartFem features regular columnists and contributors as well as guest writers and informative articles from local Experts. It also brings valuable coupons, products, and services from reputable companies right to the mobile devices of it’s members saving them both time and money. Check out the SmartFem listings page. Lea’s career is highlighted by 25 years of public relations, writing columns, hosting a radio show, and over a hundred TV appearances. Lea’s career includes news segments for ABC, CBS, NBC, and Fox TV, as well as writing a regular column for Runway Magazine, North Valley Magazine and AZ Weekly. Her articles have been featured in 101North, So Scottsdale, The Business Journal and Phoenix Woman. Previously as the founder of Lasting Impression Consulting and now SmartFem.com she has been retained by businesses all over the valley to help them improve their visibility and potential through the media. 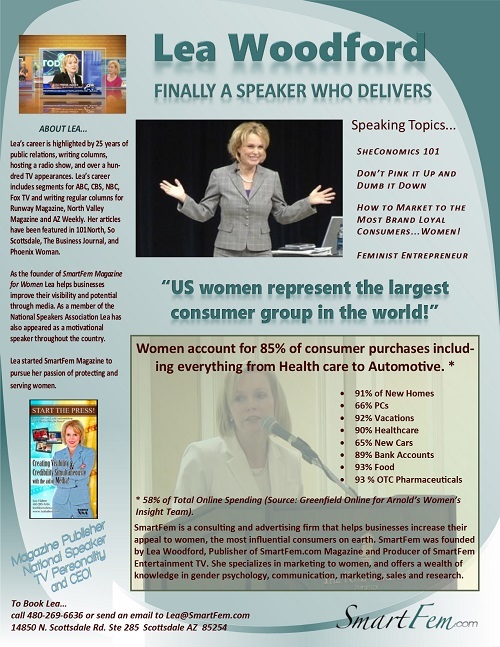 As a member of the National Speakers Association, Lea Woodford has also appeared as a motivational speaker throughout the country.